One actor plays eight different roles in a hilarious musical comedy at the Kennedy Center. He tells WTOP how he does it. WASHINGTON — It won four Tony Awards in 2014, including the top prize of Best Musical. 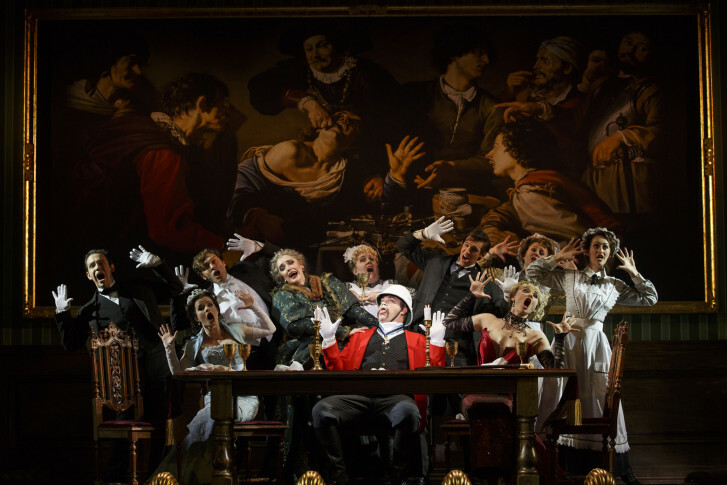 Now, the same week it ended its Broadway run, “A Gentleman’s Guide to Love & Murder” brings its hilarious musical comedy to our nation’s capital at the Kennedy Center now through Jan. 30. Featuring a Tony-winning book by Robert L. Freedman and lyrics by Steven Lutvak, the show opens in 1909 Britain as Miss Shingle (Mary VanArsdel) informs Monty Navarro (Kevin Massey) that he’s a distant heir to a family fortune. The news quickly creates a love triangle between Sibella (Kristen Beth Williams) and Phoebe (Adrienne Eller), but there’s a catch: before Monty gets the inheritance, he has to knock off eight heirs ahead of him in the line of succession, all played by John Rapson. “It’s a big fat musical comedy farce. It’s a riot and the big crux of the show is the whole family — men, women, old, young, everybody — is all played by one actor, which is yours truly,” Rapson tells WTOP. Such a role-changing feat is amazing enough in cinema, from Peter Sellers in “Dr. Strangelove” (1964) to Eddie Murphy in “Nutty Professor” (1996) to Mike Myers in “Austin Powers” (1997). But when you have to do it in a live theater setting with a live audience, it becomes all the more impressive. How does Rapson physically achieve eight costume changes in a single production? Along the way, the Michigan-born actor portrays villain Lord Adalbert D’Ysquith, the current Earl of Highhurst; sweet father Asquith D’Ysquith Sr. and his brat son Asquith D’Ysquith Jr.; a belligerent country preacher Reverend Lord Ezekial D’Ysquith; charity activist Lady Hyacinth D’Ysquith, who’s a “big battleship of a woman;” untalented aspiring actress Lady Salome D’Ysquith Pumphrey; buff weight lifter Major Lord Bartholomew; and the country squire and beekeeper Henry D’Ysquith. How does he flip the mental switch going from one character to another? He says the biggest joy is watching a fresh audience suddenly get the running joke. Rapson follows in the role-changing footsteps of Jefferson Mays in the Original Broadway Cast. But aside from the new cast and new Kennedy Center digs, the show looks exactly as it did on Broadway with the choreography of Peggy Hickey and the Tony-winning direction of Darko Tresnjak. While the national tour has already hit the likes of Chicago, San Francisco and Minneapolis over its four-month run so far, Rapson says he’s specifically psyched to perform at the Kennedy Center.